Rhino is returning to Middle-earth on April 6 with the first soundtrack from the Trilogy, THE FELLOWSHIP OF THE RING: THE COMPLETE RECORDINGS, available on vinyl for the first time as a 5-LP boxed set. Housed in a collector's box with red leather style spine, the collection is limited to 5,000 individually numbered copies on red vinyl. 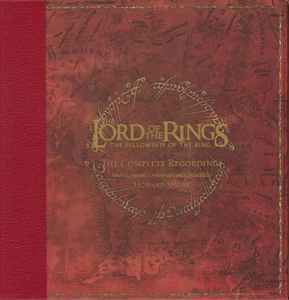 Ahh, finally, the LOTR soundtracks on vinyl. I went for these release, hoping to FINALLY get a decend sounding soundtrack (those CDs really are nothing special). I layed the first vinyl on my turntable and afer a few minutes, I couldn't help but draw a wide smile across my face. Sure, it's not groundbreaking, but it's DEFINITELY the best this music has ever sounded. Truly, the LOTR score has NEVER sounded more majestic, more dynamic, more clear. This is an astounding release, that I recommend to any fan of these soundtracks. When I listened to Bilbo's party, I could literally hear all of the instruments with perfect clarity. The Bridge of Khazad-Dum sound powerful and totally over-bass-whelming (can this be a new word? Did I just coin a new word?). The box is very pretty, if somewhat weak. You have to be careful with it (which I expect every person who buys such a set to be). The booklet is made of quality paper, really glad when I saw it. And the third of the map of Middle-Earth is extremely cool. All in all, a fantastic release with clear and deep sound. A true collector's item, through and through. Buy it before these prices skyrocket. At 27.07.18 realease the Limited box of Two towers on Blue Vinyl! Preordered this from Barnes and Nobles and it is fantastic. I would recommend listening with headphones, the pressing is a bit quiet....but there is absolutely no surface noise and there are only like 3 very quiet pops throughout the entire 5 records. Highly recommend..
Whilst the pressing quality isn't terrible by any means, it's enough for me to pass on buying the next two installments of this set, with some noticeable static and pops through-out. Everything about this release from the sound to the packaging quality feels like they've cheaped out a bit. Is there plans to reprint sell more of these? I just noticed that it even existed and do not want to pay the huge markup. This desperately needs a reissue. I preordered it from Amazon.ca as soon as it went up, it was out of stock on release day, so I ordered it on Banres and Noble when it said it was in stock, wait weeks only for the order to be canceled and I refuse to pay double or more from a third party. I don't care about the fancy case or coloured records, I just want the music in hand. They obviously severely underestimated the demand for this and many people seem to have been left out in the cold on it. European units were sent inside a fit-to-box package with sponge parts! All inside a larger Amazon box. Very beautiful package - resembles the original CDs boxes. Copy 4002 / 5000 - Portugal. This was shipped to me with the box set snugly housed inside an LP mailer which was then placed inside a significantly larger box stuffed tight with packing paper so the inner box didn't move around. I received it in really excellent condition when sent in this way. It's a beautiful box set, the liner notes are quite extensive, and most importantly the mastering and pressing are top notch. This sounds superb, dynamic, just an epic box set. Can't wait for the Twin Towers set to come out. Unfortunately mine arrived in very poor packaging from Amazon and as it was an overseas shipment (USA - UK) my box suffered slightly for it. Specifically; scuffing on the four corners of the top and bottom left of the box, and a tear on the bottom left wall (which I suspect a quick dab of unnoticeable glue will fix. But other than that I can't say I fault the overall quality of the box badly. Everything else seems stable and glued down properly. I contacted Amazon about the packaging and the damage that was caused by it, and of course they couldn't replace it so I got a $50 refund. Which is $50 towards the The Two Towers I suppose! Listening to the first disc now and it's just gorgeous - having the liner notes in 12" size just seals the deal. And what's with the little 12"x24" poster? I'm guessing we'll be getting the rest of the map with the next couple of releases! mind you, it's only a small section of the map - which tells me 3 pieces more might not cover us all the way to Mordor, which means perhaps we should expect The Hobbit to be reissued on vinyl as well? My copy arrived yesterday. I have the same complaint as some people here. The packaging is really flimsy and already falling apart. A shame considering how beautiful the box looks. I'm tempted to put it together with super glue or something. Otherwise happy with the purchase, but for $100+ i'm disappointed in the box quality.